From a test engineer's point of view, it is easy to get confused with LEADS and LEAD ELECTRODES, because for a typical electrical engineer, "lead" and "electrode" are basically the same thing. But there is more confusion here than just terminology. How do they get a "12 lead ECG" for a cable with only 10 leads? Why is it that many tests in IEC standards ask you to start with RA, yet the indication on the screen is upside down? Why is it that when you put a voltage on RA, a 1/3 indication appears on the V electrodes? LEAD ELECTRODES are defined as the parts that you can make electrical connection to, such as RA, LA, LL, V1 and so on. On the other hand, LEADS are what the doctor views on the screen or print out. There are a couple of reasons why these are different. Whenever you measure a voltage it is actually a measurement between two points. In a normal circuit there is a common ground, so we often ignore or assume this second reference point, but it's always there. Try and measure a voltage using one point of connection, and you won't get far. ECGs don't have a common reference point, instead physicians like to see different "views" of the heart's electrical activity, each with it's own pair of reference points or functions of multiple points. One possibility would be to always identify the points of reference, but this would be cumbersome. Instead, ECGs use labels such as "Lead I" or "Lead II" to represent the functions. For example "Lead I" means the voltage between LA and RA, or mathematically LA - RA. Thus, a test engineer that puts a positive 1mV pulse on RA relative to LA can expect to see an inverted (negative) pulse on Lead I. Leads II and III are similarly LL-RA and LL-LA. The waveforms aVR, aVL and aVF are in effect the voltages at RA, LA and LL respectively, using the average of the other two as the second reference point. Waveforms V1 ~ V6 (where provided) are the waveforms at chest electrodes V1 ~ V6 with the average of RA, LA and LL as the second reference point. These 12 waveforms (Lead I, II, III, aVR, aVL, aVF, V1 ~ V6) form the basis of a "12 lead ECG". 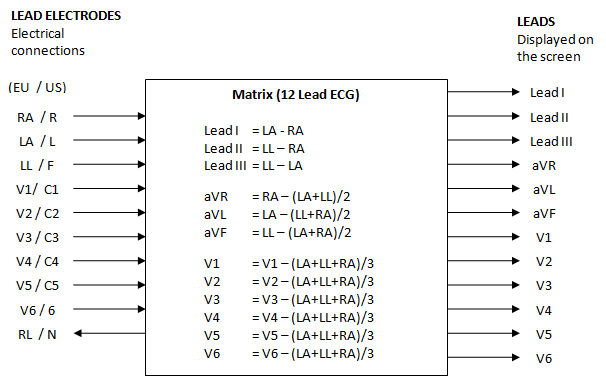 Whether you are working with IEC 60601-2-27 or IEC 60601-2-51, you can refer to the diagram above or Table 110 in IEC 60601-2-51 which shows the relationship between LEAD ELECTRODES and LEADS. Finally, you may ask what is RL (N) used for? The typical mistake is to assume that RL is a reference point or ground in the circuit, but this is not correct. In most systems, RL is not used for measurement. Rather it is used for noise cancellation, much like noise cancelling headphones, and is often call a "right leg drive". It senses the noise (usually mains hum) on RA/LA/LL, inverts and feeds back to RL. For testing IEC 60601-1, engineers should take note of the impedance in the right leg drive, as this tends to be the main factor which limits dc patient currents in single fault condition. To check your understanding of the matrix, try the following exercise: if a 1mV, positive pulse (e.g. 100ms long) was fed to RA with all other inputs grounded, what would you expect to see on the screen for each lead? The answer is at the end of this page. In years gone by, the relationship (matrix) above was implemented in analogue circuits, adding and subtracting the various input voltages. This meant that errors could be significant. Over time, the digital circuits have moved closer and closer to the inputs, and as well the accuracy of remaining analogue electronics has improved, which means it is rare to get any significant error in modern equipment. The newest and best equipment has a wide range high resolution input analogue to digital conversion very close to the input, allowing all processing (filtering as well as lead calculation) to be performed in software. It is interesting to note that mathematically, even though there are 12 Leads, there are only 8 "raw" waveforms. Four of the 12 waveforms can be derived from the other 8, meaning they are just different ways of looking at the same information. For example, Lead III = Lead II - Lead I. It makes sense, since there are only nine points electrical connections used for measurement (remember, RL is not used for measurement), and the number of raw waveforms is one less than the number of measurement points (i.e. one waveform requires 2 measurement points, 2 waveforms requires at least 3 points, an so on). This is the reason why systems can use 8 channel ADC converters, and also why the waveform data used IEC 60601-2-51 tests (such as CAL and ANE waveforms) uses just 8 channels of raw data to create a full 12 Lead ECG. Although the standard usually indicates that RA is the first lead electrode to be tested, if you want to get a normal looking waveform from a single channel source, it is best to put the output to LL (F) so that you get a positive indication on Lead II. Most systems default to a Lead II display, and often use Lead II to detect the heart rate. If your test system can select to put the output to more than one lead electrode, select LA and LL, which will give a positive indication on Lead I and Lead II (although Lead III will be zero). If a +1mV pulse was applied to RA only, the following indications are expected on the screen (or printout). If you did not get these results or do not understand why these values occurred, go back and study the matrix relationships above. For the Lead electrodes, use RA = 1 and for all other use 0, and see what the result is.